A 19th Century castle in Conwy is to be turned into a 90-bedroom five star hotel, its new owners say. 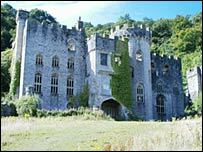 The Grade I listed Gwrych castle in Abergele will undergo a £6m restoration over three years. Yorkshire-based Clayton Hotels, which bought the building for £850,000, says around 100 jobs will be created at the hotel, which will include a health spa. The Gwrych Castle Preservation Trust, which is advising, said the plans were "faithful" to the building's history. Clayton Hotels bought the castle at auction in June 2006. The restoration and development project is subject to planning permission and it is anticipated to take two to three years to complete. Mark Baker from the Gwrych Castle Preservation Trust said they had been advising on both interior and exterior plans for the castle, which was built in 1819. "We hold the architectural drawings, photographs and examples of what was there before and so have been working with the owners to come up with some excellent plans," he said. "They are remaining faithful to the building and I think the plans will bring out the best in the castle." Gwrych Castle had fallen into disrepair over the course of 17 years after its previous owner did not develop it despite initially unveiling plans to do so. Since closing to the public in 1989, it had been vandalised and looted. Before that, the building was open to the public and named 'The Showpiece of Wales'. The castle was also was used to house 200 Jewish refugees during World War II. During its life it has also served as a training ground for boxer Randolph Turpin and also provided the backdrop to the 1996 film Prince Valiant, starring Edward Fox and Joanna Lumley. Kris Clayton, chairman of Clayton Hotels said the castle was a "superb example of romantic architecture". He said that the restoration would "breathe life back into the building".